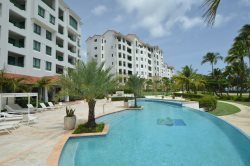 Our luxury 3 level condo located at the exclusive Las Balandras, Cerro Gordo (Dorado) offers spectacular ocean views for a peaceful retreat. The condo has 3 beautiful bedrooms with 2 queen beds and 1 bunk bed ( 1 full bed and 1 twin bed), 3 full bathrooms, fully equipped kitchen with luxurious granite countertops, dining room, living room, expansive terraces with ocean view and pool. It is decorated with elegant furniture and it is fully equipped for stays from 1 month to long term rentals. Our beautiful vacation rental condo has a few added amenities for the comforts of our guests, including a private jacuzzi on the 3rd level and fully furnished terraces with spectacular ocean views. Las Balandras has 2 private parkings, Cable TV, WiFi, ocean view, pool and all the comforts you may need for a spectacular retreat at a luxury vacation rental.